1. The sun came out for about 10 minutes. I got so excited I had to post a picture on Instagram (@truly_polished). 2. Dollish Pollish had a mini restock of her leftover polishes and I got some! I may or may not have posted a little while ago that I missed out. There was a HUGE amount of buzz about the last restock and it sold out within about 30 seconds... I was one of the people clicking refresh from 10 minutes before and I still missed out! Anyway, I noticed a tweet about three minutes past 8 saying there would be a mini restock at 3pm EST, which I was sure was 8pm my time! I checked and it was true! I got Heart of Glass by refreshing and clicking add to basket, then I checked out because I was so scared my basket would empty!!! Then I composed myself, went back and tried my luck with a couple more. I tried the same technique and got Putting on the Ritzzz and Spank You Very Much. I feel bad because I know I got my polishes because someone else's cart emptied, but when I get my pretties, the guilt will all fade away! Anyway, enough of all that and on to the polish! 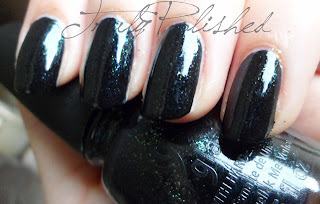 I have China Glaze Smoke and Ashes for you! This polish is from the Hunger Games Capitol Colors collection (inspired by the Hunger Games movie). I used this as a base for Luxe and Lush a couple of days ago but here it is on it's own. 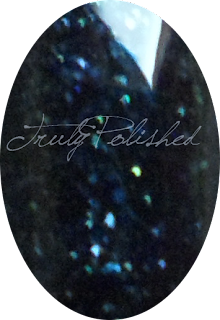 This is a very blackened green glass fleck polish, there aren't enough like this around, let me tell you! The formula on this was amazing! It was a one coater for me, but I did put a second coat on to see if it changed the look of it, which it didn't! Side view - look at those glass flecks! This is the polish I was most looking forward to from this collection, and it really didn't disappoint. This kind of colour is perfect for when I'm in a bad mood and I want to show it with my nails! I also wear colours like this on my toes all the time. Right now I have Cult Nails Living Water on my toes but I think this will be finding its way onto them soon!